This is the original Pilot model. It's so old it actually says "U.S. Robotics" on it. It holds half a meg of RAM and has the basic computing power of a Macintosh SE. There's no backlight. I actually bought this brand new when they first came out. 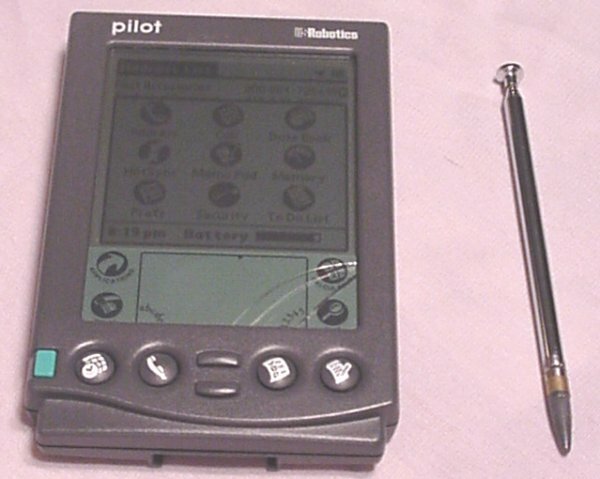 I'm not usually an early adopter, but I knew the moment the Pilot came out that it was going to be successful. So I bought one. I later upgraded the RAM to a whole meg. But the little guy has been restored to it's original configuration. (Actually, we put the upgrade card into my wife's old Pilot Personal.) 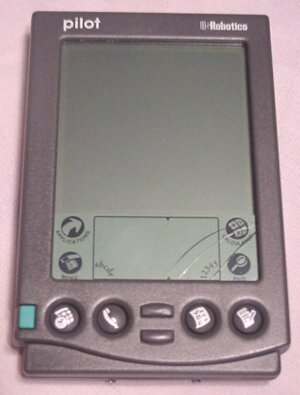 Eventually, my work sprung for a Palm Vx for me. 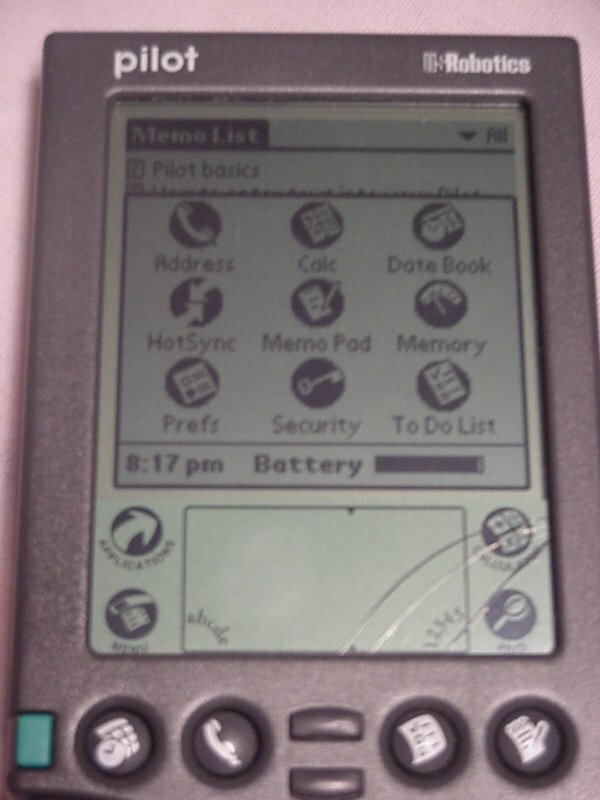 We upgraded my wife to a Palm IIIe just before her work decided to buy her a Palm IIIc. So, we have five of the little units in the family. Even with the cracked screen, this Pilot works great. Well, maybe not great. The area under the cracked screen doesn't work anymore, but the rest of it is fine. Here's a larger photo of the unit. Underside. 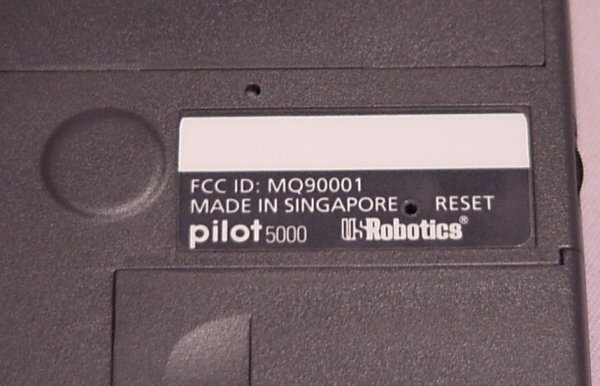 You can tell it's an original Pilot because the serial number and bar code have worn away. The earliest models had these printed in ink that rubbed off fairly easily. 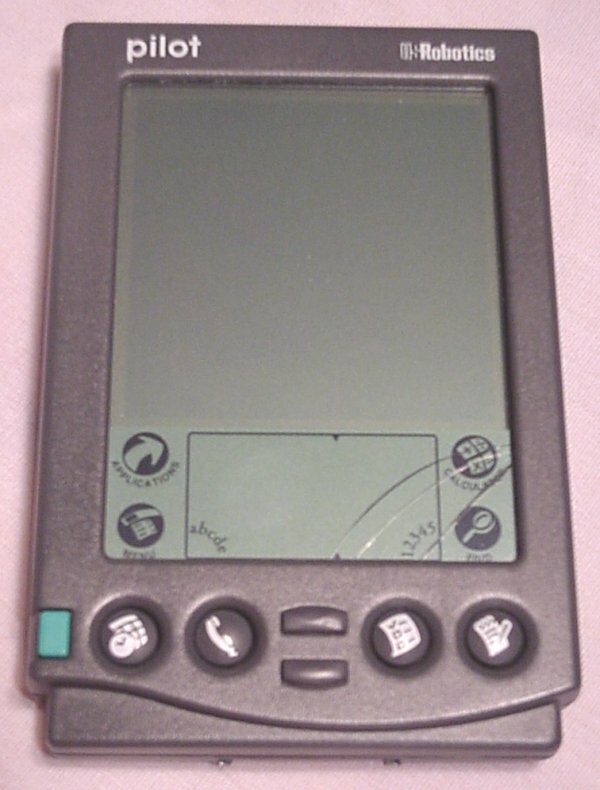 Later models had the ink covered with a plastic film. Oh well, it's not like it's still under warranty! Memory Display. That's right! 512 big K's of space. Most of it free since we just reset it. Screen Shot. 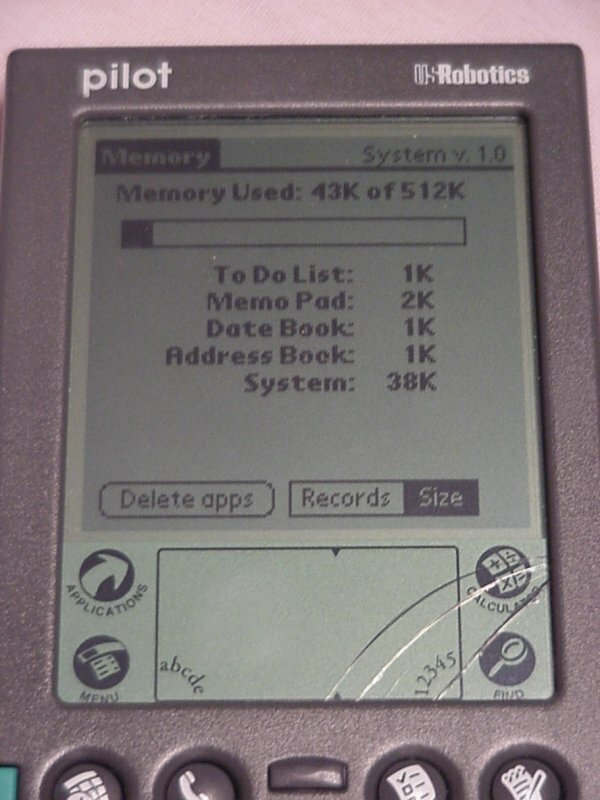 Here you can see the basic applications that are in the ROM. Retracted Stylus. With this Pilot, I used a homemade stylus. The instructions came from Trotter Hardy at the William and Mary Law School. 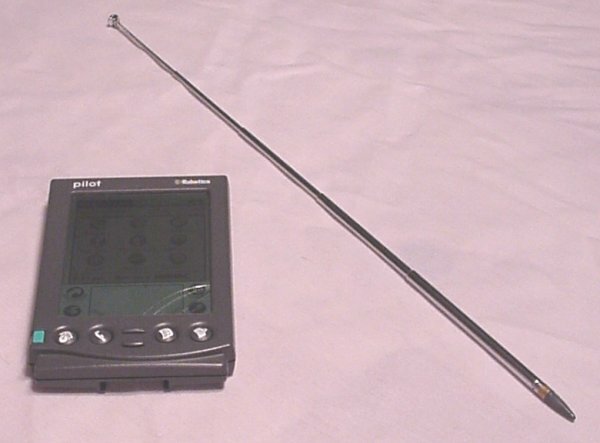 The idea is to snip the end off of a standard stylus and affix it to an antenna from Radio Shack, the end result being an extendable stylus. Extended Stylus. Here's the stylus extended to its full length. Once, at Washington National Airport (which I refuse to call Reagan National Airport because I'm a pinko liberal), there was a family sitting across from me, the father of which also had a Pilot. I took mine out and casually whipped out my long stylus. The man's son took one look and informed his father: "Daddy, that man's thingie is much longer than yours!" Somehow, the father managed to just sagely nod and reply, "Yes son, it is." Click here to view all comments for the U.S. Robotics Pilot 5000 and to leave your own. Click here to view comments about other U.S. Robotics computers.